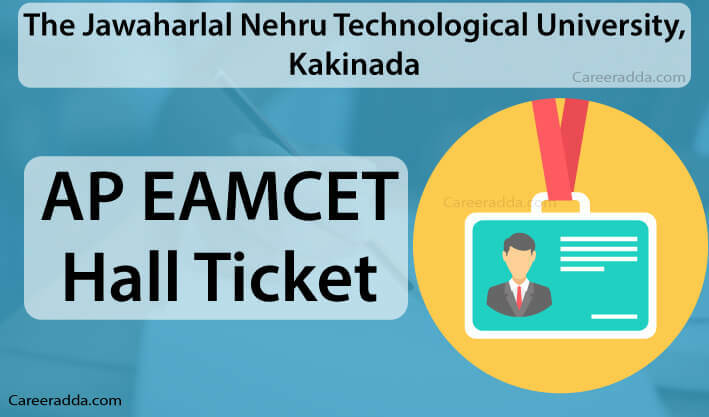 Download AP EAMCET 2019 Hall Tickets : Andhra Pradesh Engineering, Agriculture and Medical Common Entrance Test 2019 (AP EAMCET 2019)Hall tickets will be issued by the Jawaharlal Nehru Technological University, Kakinanda tentatively in first week of April 2019. Once hall tickets are released, aspirants of AP EAMCET 2019 can download them from website www.sche.ap.gov.in/eamcet. AP EAMCET hall ticket shall be the mandatory document, without AP EAMCET hall ticket 2019, a candidate will not be able to write AP EAMCET exam. Along with the AP EAMCET hall ticket 2019, candidates are needed to bring the caste certificate (if applicable) and attested copy of application to the examination centre. Candidates can obtain their hall tickets for AP EAMCET exam 2019 by entering ‘Registration Number’, ‘Qualifying Examination Hall Ticket No’ and ‘Date of Birth’ at official website. After downloading hall ticket, candidates must check the details such as their registration number, name, parent’s name, roll number etc. Read the entire article till the end to know everything about the AP EAMCET 2019 hall ticket including the procedure to download it. After downloading hall ticket, the first thing candidates will have to do is checking of the details printed on it. Candidates should verify all of the details printed on their hall tickets. Then paste a duly attested recent photo. Photograph should be attested by the principal of the college or any gazetted officer. Q. I’m Unable To Download My Hall Ticket. What Should I Do Now? A. You are advised to try again later. If you will face the same problem then you must contact the examination conducting officials. The contact details are – 0884-2356255 (O), 0884-2340535 (O) and e-mail: apeamcet18@gmail.com. Q. From When I Can Download My Hall Ticket? A. You can download your hall ticket from first week of April 2019 till the day of exam. However, exact dates for download hall tickets are still not disclosed by the authorities. Q. Is There Any Possibility To Get Hall Ticket By Post / Parcel / Courier? A. No, hall tickets for AP EAMCET 2019 will not be send to candidates’ address by post. Q. How Many Sessions Will Be There In AP EAMCET 2019 Exam? A. There will be two sessions for both types of professional courses. a candidate can opt any session to appear for the exam.